What are the Major Problems with Theistic Evolution? - READY... SET... QUESTION! The idea of God saying “let there be evolution,” is being forced upon Christianity more now than ever. Dirty money from anti-Christian organizations is flooding the pockets of heretical pastors and theologians who spread the new religious faith of theistic evolution. In fact, I am writing a book about this issue, feel free to read about that project here. Now, let’s dive into the major problem with the idea of God having used evolution to create, otherwise known at theistic evolution. 1. SUPPORTERS OF THEISTIC EVOLUTION CLAIM BIOLOGICAL EVOLUTION TO BE A SCIENTIFIC FACT. Evolutionary biologists have overtly and consistently discounted the idea of theistic evolution. The scientific merits of theistic evolution are deemed as non-science before the scientific merits of biological evolution are addressed. Yet, the idea of natural selection causing new species to emerge cannot be observed, tested, replicated, or verified scientifically. Evolutionary biology cannot meet the criteria of science and has been left intentionally undefined in order to hide this fact. Also, evolution cannot meet the legal criteria for what is allowed to be taught in public school. I wrote a book called WHAT IS EVOLUTION and produced a short film explaining these issues. 2. SUPPORTERS OF THEISTIC EVOLUTION CLAIM THEIR STANCE TO IMPACT NO THEOLOGY. Theistic evolution must adhere to the evolutionary explanation of species arising in family groups, they also must claim sin to not be from the lone Biblical first man known in Genesis as Adam. Theistic evolution predicts an Adam-like character to have been chosen by God out of an existing, soulless, early human-like group to receive a soul and be fully human. Although there is no scientific data, nor scriptural basis for the idea, this Adam-like human somehow broke God’s command and fell into sin. The theistic evolutionary “Fall” is predicted to have happened with this Adam-like character, but sin spread through social interaction and not by the inheritance of a cursed human birthright through the bloodline of a literal man named Adam. There are two major problems with theistic evolutionary predictions of an existence of soulless, early human-like organism and the idea of sin being passed on through social interaction. Firstly, we must ask what happened to the larger population of soulless, early human-like organisms. They are predicted to be anatomically identical to humans, only they do not have a soul. With that said, the fossil record could not differentiate between true humans and these soulless precursors. It would be logically reasonable to assume that since the soulless, human-like organisms were a larger population than the Adam-like character chosen to have a soul; the soulless human-like organisms propagated more rapidly and their descendants are alive today, living among us. Theologically speaking, there must be people among us that are soulless and not in need of a Redeemer. The second major problem with the theistic evolutionary predictions of an existence of soulless, early human-like organism and the idea of sin being passed on through social interaction has to do with sin itself. The prediction of human sin being acquired through social interaction inversely predicts the possibility of humans to be able to also rid themselves of sin through social interaction. If humans are able to alter their own state of sinfulness based on social interaction, there is no need for a Redeemer. If humans are not sinful by nature due to receiving a cursed birthright via the bloodline of Adam, then the crucifixion of Jesus Christ is logically & theologically pointless. 3. SUPPORTERS OF THEISTIC EVOLUTION CLAIM THEIR STANCE TO CAUSE NON-BELIEVERS TO CONSIDER CHRISTIANITY. The data is clear, naturalistic explanations are causing Christians to leave the Church. 4. SUPPORTERS OF THEISTIC EVOLUTION CLAIM EVOLUTION TO BE NEITHER RELIGIOUS OR NONRELIGIOUS, JUST SCIENCE. Natural selection was intentionally developed to specifically communicate that no supernatural force was involved in the emergence of biodiversity. Darwinian evolution inherently excludes theistic involvement, showing theistic evolution to be oxymoronic. 5. SUPPORTERS OF THEISTIC EVOLUTION CLAIM THEIR STANCE TO BE A NON-ISSUE. If we choose to, first, identify ourselves by actions, ideas, politics, philosophies, theologies, or anything else that places the supreme authority of Jesus Christ into question; we also place our salvation into question. Therefore, a maturing Christian that is wrestling with the “how” of Origins will ultimately have a loosening grip on biological evolution. Theistic evolution is an idea that is not accepted by the evolutionary community, nor by the community of Christ followers who view the Bible as the Word of God. The idea of God using evolution to create could not arise from the text found in Scripture, but rather is dependent upon a commitment to evolutionary dogmatism before a single word is read. Theistic evolution adulterates the Biblical texts so much that it has become a unique faith with its own theology. 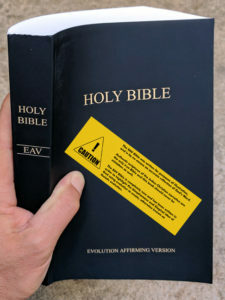 In fact, a theistic evolutionary reading of the Bible must be “interpreted” so far from what is actually written that a new version of the Bible has been written. The Evolution Affirming Version (EAV Bible) is the first version written that affirms an evolutionary worldview. Previous PostWhy Did I Act Like an Atheist?Next PostWhat are Katalogetics?